Win A Million Video Slot Review - Casino Answers! 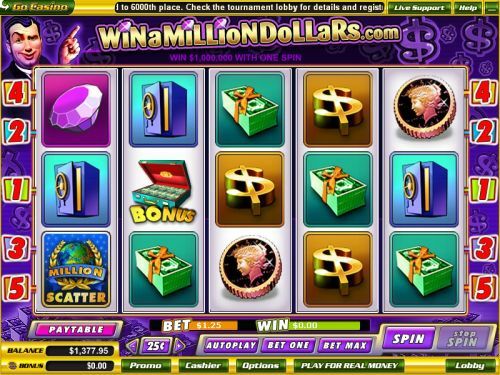 Win a Million is a 5-reel, 5-line video slot developed by Vegas Technology, featuring a wild symbol, scatter wins and a jackpot. You can play the Win a Million video slot at Bovada. Win a Million is a penny slot game. Bets on the Win a Million slot machine are $0.01, $0.05, $0.10, $0.25, $0.50, $1 and $5 per line. You can select up to 5 paylines on the Win a Million online slot. You can bet up to the maximum total bet of $5 per spin, which is a decent betting range, considering how many paylines are on the slot. Players can skill stop the reels by pressing the “Stop Spin” button in mid-spin. To play Win a Million, select your bet and hit “Spin” or to play the maximum bet, hit the “Bet Max” button. The Million symbol is the scatter symbol on the Win a Million casino game. When making a $5 bet per line on all five paylines ($25 total bet), if you land 5 Scattered Million symbols on the reels, you will win $1 Million Dollars. Yup, that’s right – you can win $1,000,000 on a single spin just by landing five symbols! If you make a bet of anything other than $5 on all 5 paylines, you will instead win 15,000 coins. When making any bet on 1-4 lines, 5 Million scatter symbols will win you 10,000 coins. Other high paying symbols on the Win a Million video slot include the Donald Trump (5000 coins), Older Millionaire (3000 coins), Bed of Cash (2000 coins) and Gem (1000 coins) symbols. You can win $1,000,000 by playing the Win a Million video slot at Bovada! Winning combinations must be left to right (except scatter symbols). Payline wins are multiplied by the bet per line. Scatter wins are multiplied by the total bet and added to payline wins. Only the highest win is paid per selected payline. Wild symbol is counted as any other symbol except for the scatter and bonus symbols. 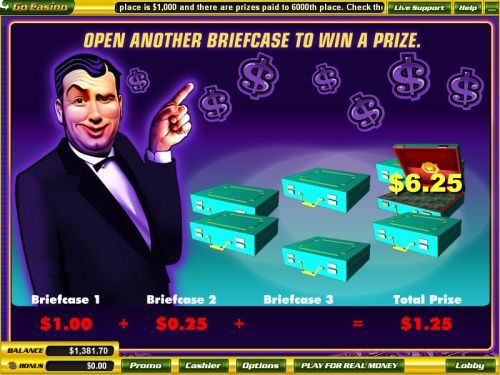 The Win a Million video slot offers an autoplay feature with advanced settings. Hit “Autoplay” to open up the Win a Million autoplay mode where you can select the number of spins (5, 10, 25, 50, 100, 250 or 500) and number of seconds between spins (1, 1.50 and 2). Stop settings include stop once all spins are complete, stop when jackpot is won, stop if a win exceeds or equals ($50, $100, $150, $200 or $250), stop on any win and stop if credits increase/decrease by ($50, $100, $150, $200 or $250). You can cancel autoplay on the Win a Million online slot at any time. Win a Million offers a huge $1,000,000 jackpot as well as a bonus game. The prizes are so good that it’s definitely worth playing a few spins to see if you can Win a Million! To play Win a Million, sign up and make a deposit today at Bovada. Where can players from the USA play the Win a Million video slot? Players from the United States of America are welcome to play the Win a Million slot game at the USA-friendly Go Casino!